They leave and discover the real truth of the world, the size of it, the history of it – and why their city, why Chicago, even existed. In doing so they learn everything they once knew, everything they once treasured is a lie – it’s meaningless, a manipulation for a completely alien goal. But as they spend time outside the city with the Bureau, they find both some shocking revelations about their identity – and a new set of lies spread by a new dominant, governing force. 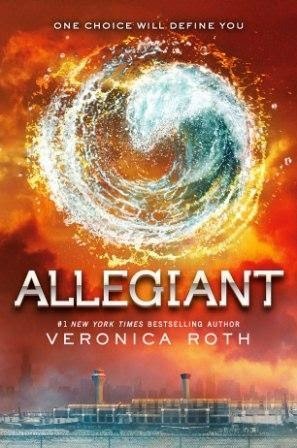 I have a huge problem with the writing of this book – it is told from the point of view of both Tris and Four/Tobias, each chapter topped with their name. This is essential because without that name there is no way to tell who is speaking. Tris and Four have exactly the same voice – which is terrible for two such very different people. There was actually a moment when I thought Tris was revealed as bisexual because it talked about her girlfriend before I realised we’d had a character shift. 4 pages ago. I read 4 pages assuming Tris was the protagonist when it was actually Four/Tobias. That’s… not good. Equally, I found Tris and Tobias’s romance to be… so unnecessary. I can’t say, unlike the last book, that it was badly done. There is some interesting conflict there – I particularly liked the conflict over whether Tobias trusts/respects Tris; it not only analysed Tobias not listening to her or keeping things from her but also raise the counterpoint that “not doing what you say” is not the same as “not listening to you” and Tris’s habit of conflating people not agreeing with her as not trusting her. I did like a lot of the personal revelations – like these people who have only known the city realising just how vast the whole world is and the culture shock of that. Or of finding out how so many of their precious ideals are just complete fabrications –it’s nicely done. The meat of the plot, which I found the romance a distraction from, though was the rebellions. In Chicago Tris was rebelling against the Erudite take over in Divergent. Here she starts rebelling against the Factionless take over that happened in Insurgent. She ends up outside the city, learning the true, deep and fascinating history behind the lies she has been taught all her life and why Chicago and the factions even exist. And there she finds another dominant faction and another rebellion. The dominant faction is “kind” in a patronising way, but over and over again it’s clear that the dominant faction abuses the weaker one, controls them and even while apparently having “kind” agendas to “help” them, is very much keeping them down – in part by destroying their own self worth. It’s also interesting in that it shows this, shows the blatant discrimination, the patronising dehumanisation, the lack of the weaker faction in any places of power, while at the same time having the legal fiction of equality – showing the limits of such legal equality, even while it is important. Ultimately, from factions against faction, to factionless against factions, to the genetic divide – the books hammer home that people will always seek to “other” other people. Always seem them as different – and because of that difference they see them as either. Every new layer just reveals yet more prejudice, more othering and more attacking each other and often using the same tools: secrets, lies, revisionist history, demonisation over and over again. It does miss a lot of nuance. As a message, it’s a meta-message which runs rather roughshod over the individual issues in each case, especially the individual marginalisations – but I think it is trying to draw the meta-message – that humanity is always looking for an excuse to hate or demean or blame anyone who they can deem other from them. There’s also another good ongoing message – don’t jump on the first revolution wagon coming along. Just because you hate the current system, doesn’t mean that any group opposing it is necessarily going to replace it with anything more palatable: look at Evelyn and the factionless taking over the city in Insurgent the rebellion. But not just what they’re replacing it with – but also the cost they’re willing to endure to change the system. How many people are they willing to kill? For that matter, how competent or capable are your fellow rebels? Can you trust them to reveal their true plans which you are helping? All in all it’s an excellent secondary message of “the enemy of thy enemy is really not always your friend” or good for that matter… It’s nice, nuanced and powerful. There are areas, though, where I don’t think the world building quite held together. The underlying message, for example, kind of relies on the difference between the two new groups to be not too great and a lot of the latter half of the book made that point. But at the same time we’re told there are several experiment cities like Chicago and they all fell apart – in fact, Chicago was alone among the cities that held it together because of the broken Faction system – the same system that we’ve spent the last two books showing how contrived, broken and unworkable it is. Instead of this system being utterly hopeless and broken, we learn that it was the only way to stop the people within from killing themselves (and even then, it merely delayed the inevitable). So why can these people not form a single functioning government without being drugged to the eyeballs? In half a dozen different cities, with multiple memory “resets” and they only one that worked required the faction system and lots of happy drugs? If they’re not broken, why are they so utterly incapable of running their lives? It felt like two narratives smushed together. We had the inherent brokenness of Chicago and how the faction system didn’t work as it was slowly revealed that, no, it didn’t, that Divergent were the real point and the final revelation that this system was put in place, despite bring broken, as the only way to stop the inmates from breaking themselves and everything else – linked on to how the powers that be are oppressively focusing on a relatively irrelevant difference as an excuse for oppression and spending lots of money “curing” a disease that isn’t there. Pick one – because I don’t think they work together. For that matter, if preserving the Divergent was the true name of the game then I would have thought the Bureau could have mustered more intervention than dropping a 15 year old into the mix. The entire reason or this multi-billion dollar, decades long experiment is at risk! Quick, dispatch a 15 year old! And this is aside from my other world building nitpicks that I’m trying to ignore – like how does Chicago function? It has no contact with the outside world – so where do they get fuel for the vehicles? Cotton for their jeans? Where do they get the variety of raw materials that a city with their level of technology and existence needs?